Haiyan has been listed by Thinkers 50 in “On the Guru Radar” and short listed for the “2011 Global Village Award.” She has also been included in the list of “New Guru” by The Economic Times. Ms. Wang co-writes a regular column for Bloomberg BusinessWeek and blogs for Harvard Business Review. She is the co-author of two highly acclaimed books: Getting China and India Right (which received the 2009 Axiom Book Awards’ Silver Prize as one of the world’s two best books on globalization/international business) and The Quest for Global Dominance (2nd Edition). Her co-authored new book The Silk Road Rediscovered: How Indian and Chinese Companies Are Becoming Globally Stronger by Winning in Each Other’s Markets will be published by Wiley in April of 2014. Her opinion pieces have appeared in top international media such as The Wall Street Journal, BusinessWeek, Financial Times, Chief Executive, Wired, The Economic Times, China Daily, The Times of India, South China Morning Post, as well as other outlets. She has also been frequently interviewed by CNBC, The Wall Street Journal, Fox Business, India Today, CCTV, CNN Expansión, Shanghai Daily, INSEAD Knowledge, and other prominent business media. 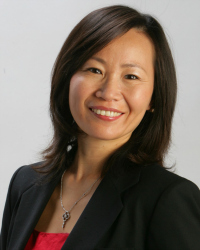 In the United States, Haiyan began her career working as a management consultant with Princeton, NJ based Kepner-Tregoe, Inc.. She provided executive training and consulting services in the areas of strategic decision-making, complex project management, and organizational process redesign. Her clients included some of the largest corporations in the U.S. and Asia including Johnson & Johnson, Corning, Sprint, and the Singapore-based Far East Ship Yard. She also served as Director of Business Development at E-Steel Corporation, a New York based pioneer in e-marketplace in the global steel industry. At E-Steel, she led the company’s efforts to form partnerships between the company and top Chinese steel producers such as BaoSteel. Haiyan also served as a senior marketing and operations executive at PTI Inc., a global manufacturer and wholesaler of consumer products with supply chain operations in the US, China and Vietnam. She helped to realign the company’s strategic focus to service top retail chains such as Target, IKEA, Kohl’s, and J.C. Penney. China 2020 – What Lies Ahead. How China will change between now and 2020 affects global industries and companies in every industry sector. Haiyan Wang will take an insider-out and outsider-in close look at the major shifts – demographic, social, economic, business and political – and how they will affect your business. Cultivating a Global Mindset. Faced with a rapidly changing global landscape, many people continue to rely on their old lenses to make sense of the world around them. The winning global leaders, whether individuals or companies, will be the ones with a global mindset who truly grasp the unprecedented transformation of the global economy and possess the capabilities to sense, filter, and integrate diverse opportunities on a global scale ahead of the pack. Haiyan Wang offers concrete guidelines that individuals and companies can use to develop a global mindset, which requires not only an openness to and knowledge of diversity across cultures and markets, but also the ability to integrate across this diversity. Global Trends and Game Changers. Business leaders must gain insight-advantage by grasping the global mega-trends and game changers of the next decade. By 2025, emerging economies like China and India will grow from 1/3 of the global GDP to about half. China will have caught up to the U.S. in terms of economy, and India, will be the third largest in the world. This growth will not be even, nor evenly distributed. Haiyan Wang looks at the coming two-speed economy and outlines the factors that will shape global business and the world – diverging demographics, stressed natural resources, and empowered individuals. In a multi-polar business world, what are the ramifications for multinational organizations? Who thrives in this new environment? Based on solid data and rich examples, Wang shares insights on the business world in 2025 and helps audiences navigate – and succeed in – the shifts ahead. Getting China and India Right. Based on solid data and rich examples, Wang illustrates that China and India are the only two countries in the world that simultaneously constitute four game-changing realities: mega-markets for almost every product and service, platforms to dramatically reduce a company’s global cost structure, platforms to significantly boost a company’s global technology and innovation base, and springboards for the emergence of new fearsome global competitors. This talk outlines how companies can leverage the market and the resource opportunities presented by the China and India phenomenon to achieve global dominance within their particular industries. Dragons and Tigers on the Global Stage—What It Means to You. Given the scale and growth rates of emerging economies coupled with access to global capital and global talent, it has now become much easier for an ambitious company from an emerging economy to become a global powerhouse and compete head-on with established giants such as Nissan, IBM, Cisco, and the like. Wang focuses on the forces that are propelling the rise of the emerging market multinational, the opportunities and challenges they face, the relative strengths and weaknesses of the Chinese dragons versus the Indian tigers, and how established companies from developed economies can compete effectively with these new challengers.